Nagano Basin is the located in north side of Nagano. It contains, Nagano City, Suzaka City and many towns around Shinano River. It is very famous for Apple. Zenkoji temple is the most popular tourist spots in Nagano Basin since Edo period. The temple is also the National Treasure of Japan. Around this area, people produce great Miso. 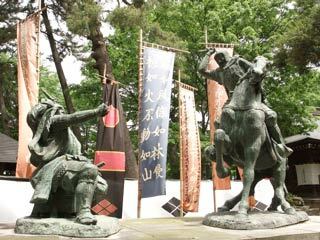 Kawanakajima, one of the most famous battlefield in Japan, is located in this area. Use Chuo Express Way to Okaya JCT. Change Nagano Express Way. Exit at Nagano. Use Hokuriku Shinkansen to Nagano Station.